In the past week, there have been several Palestinian solidarity rallies in Indian-occupied Kashmir. The conflict between India & Kashmir results from the British colonial partition when it gave up colonial control of South Asia in 1947. The occupation by the Indian military is every bit as brutal & relentless as the British colonial arrangement with Zionism in 1947 that led to Israeli apartheid & Palestinian bantustates. The resistance among Kashmiri youth has been called intifada because of it’s similarities to Palestinan political resistance. As we can see from these photos, Kashmiri solidarity with Gaza is rooted in their own struggle against occupation & their heartfelt, blood-soaked understanding of injustice, persecution, & social hatred. Our solidarity with the Kashmiri freedom movement who also stand with Gaza. Stop the massacre in Gaza! 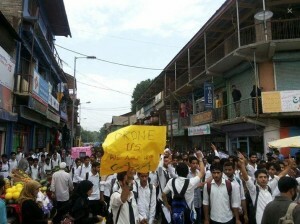 End the occupation of Kashmir! There is a struggle for self-determination in Kashmir, a state of northern India, that goes back to the contentious partition engineered by English colonialism in 1947. Today Kashmir is one of the most densely militarized zones in the world administered & occupied by over 700,000 Indian soldiers. Since the 1990s, the death toll from political conflict has risen to 68,000, with an estimated 100,000 tortured & 10,000 disappeared. Protestors around the world are facing extreme violence from riot cops, particularly assaultive weapons like rubber bullets, water cannons, stun grenade cannisters, & in some places like Palestine, live ammunition. In the Bahrain uprising, the regime hired two supercops, one from the UK & one from the US, to organize security & they began employing lead pellet guns. There were dozens of photos of protesters riddled with embedded birdshot, permanently blinded & disfigured. Because of the scattershot nature of buckshot, many children & passersby were also blinded & injured. The birdshop is made of lead & the deleterious health effects of that metal are not mitigated in pellet form. There are actually restrictions in the US on the use of lead pellets in hunting because of its negative impact on birds & the environment. In 2010 the Indian army began using pellet guns in Kashmir. They claimed they were moving to “non-lethal weapons” to quell anti-India protests. The military always forges new territory in the use of language; obfuscation is the name of their game. 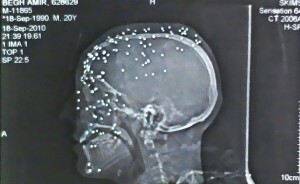 Pellet guns use hydraulic force to pump out hundreds of pellets at a time & cause widespread injuries across the body. There have been several deaths in Kashmir & hundreds of injuries, including significant “collateral damage” in people who were running to fetch milk or simply chatting with the neighbors. In every honest use of the language, this is lethal weaponry. This is an X-ray of Amir Kabir Beigh, a 22-year-old Kashmiri, showing dozens of lead pellets embedded in his skull. Looks like they were directing the pellet gun right at this eyes & head. And it looks like documentation for human rights & war crimes against Kashmiris by the Indian army. 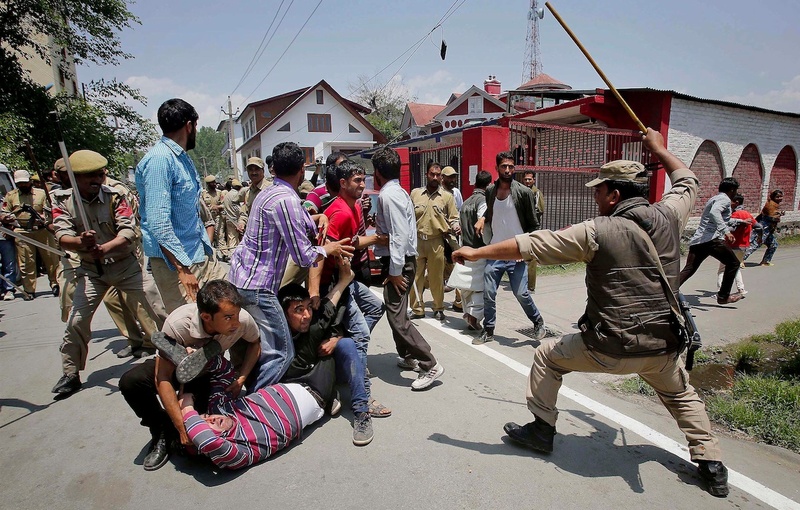 Things are not going to improve for Kashmiri justice under Modi, India’s new reactionary prime minister. His close political association with apartheid Israel bodes very badly. Colonial wars eat at the very soul of a society, engendering extreme violence at home & abroad unless they are actively opposed. The tyranny imposed in Kashmir is now being writ large under Modi. And an essential part of the alternative is solidarity with the people of Kashmir. Could someone in Srinagar, Kashmir tell us if this is the same group of government workers who’ve been protesting for the past nearly six years (if not more) with no resolution of their demands? There’s been police violence every step of the way, including the use of water cannons spewing toxic purple dye. The water cannons cause injuries to eyes, internal organs, & broken bones, & the toxic chemicals mean skin & respiratory problems. Workers are demanding payment of arrears in wages, that all temporary contract employees be made permanent, & to raise the retirement age by two years since India has no social security net. These are fairly modest demands that don’t require a revolution & certainly shouldn’t take over a decade to achieve. If India didn’t have a fairly combative labor movement & if government workers in Kashmir weren’t so intransigent this situation would be understandable. In most countries the labor officialdom is quite–let’s be frank–massively compromised & derives perks for enforcing labor peace. Mostly they sit on militancy & bring members out periodically for one-day strikes to blow off steam, not to actually exercise power. Is that what’s going on in Srinagar at the expense of these government workers? Look at these cops going after the strikers with truncheons! These government workers have stood alone long enough. Bring out the battalions of labor to demand “an injury to one is an injury to all!” & settle this strike once & for all.